We have established that playing on Thanksgiving Day boosts average ticket prices for the Detroit Lions and the Dallas Cowboys. 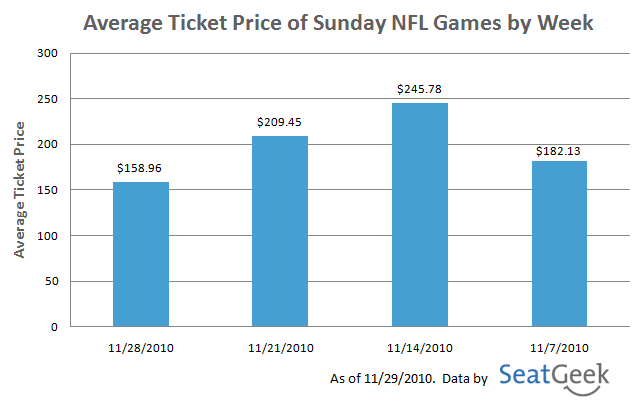 But how does playing on the Sunday following Thanksgiving impact average ticket prices? We suspected that tickets for this past weekend’s NFL games would not see as high of a demand as usual because Thanksgiving weekend is a big weekend for travel and family gathering. We think that people who would normally be buying NFL tickets are buying plane tickets instead. The chart below shows an combined average of the top 5 highest priced Sunday NFL games for each week in November. The individual games and average ticket prices that make up the chart are listed in greater detail at the end of the post. 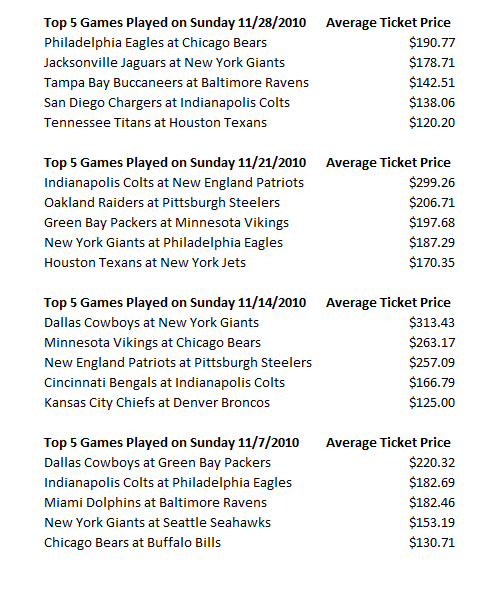 The average ticket price to the top 5 NFL games for Sunday, November 28th, the Sunday following Thanksgiving was $158.96; this is actually the lowest for any Sunday in the month of November. The Philadelphia Eagles @ Chicago Bears was last Sunday’s highest priced ticket averaging $190.77 per ticket. For the two weeks leading up to Thanksgiving, the average price for the top 3 Sunday NFL games was above $190.77 per ticket. If you would have normally gone to an NFL game this weekend but didn’t because of Thanksgiving related reasons let us know in the comments or on Twitter @SeatGeek.